Getting there: The Satay Center off the Kajang Stadium. Entering the den of the satay captal of the world, one would notice the hyper competitive atmosphere. It seems like the battle for the popular boys in blue of Hj Samuri vs the boys in red of the others. 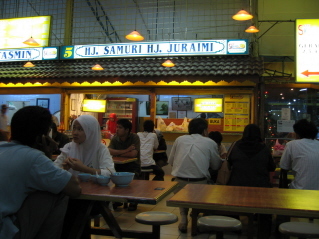 Hj Samuri seems to dominate half the Satay Center and almost the entire crowd. 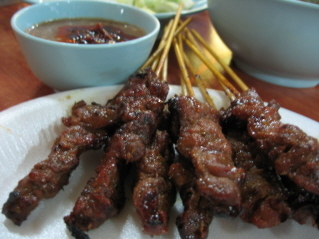 The trademark is the large chunky satay meat pieces. The thing I like is the separation of chili paste with peanut sauce; the spiciness of the peanut sauce can be adjusted according to one’s taste. They ran out of “perut” or stomatch when I ordered, so I had 10 sticks of beef. Each stick (skewer) has large chunks of meat, so 10 is a lot. They have nasi impit and ketupat, your choice. The main difference is, the use of coconut leaf; traditional vs modern methods to make compressed rice. Ketupat being the traditional with coconut leaf and nasi impit being the modern using plastic. The sticks can be sticky at times due to the sloppiness of mass production. On the menu is a whole range of other kinds of meat (except pork). Most exotic meat is seasonal. Remarks: Would rate food better if the food came hot. They have a few branches here and there.